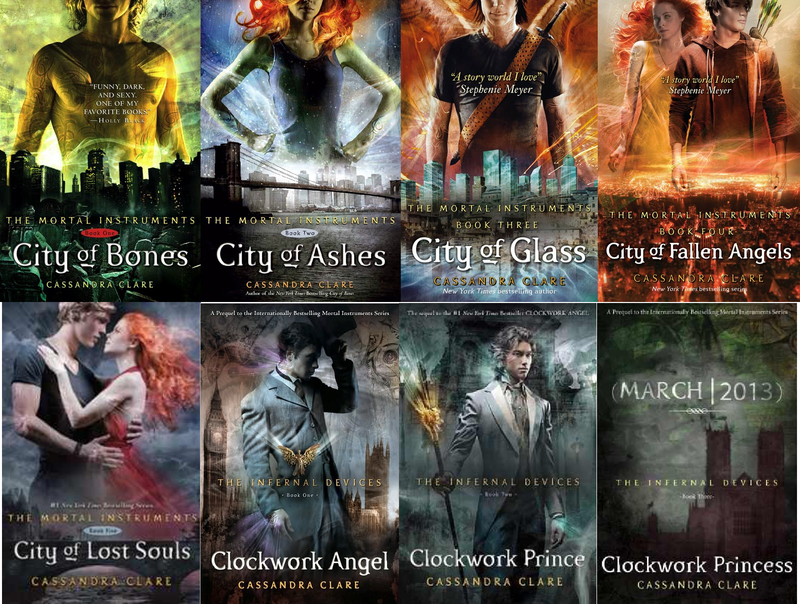 With the final book in The Mortal Instruments recently released, it ends the second big series to come from author Cassandra Clare. Last year, she had finished her trilogy The Infernal Devices, which was a prequel of sorts for The Mortal Instruments. Fans who have read both series can’t help but compare the two series to see which book series actually came out better. Below is the list of the major categories and how each book fared and which book did better. You should know that there are going to be plot points discussed below so if you haven’t read both series yet, then I would wait until you have before reading this. Unless of course you don’t care about spoilers. Clare has created such a complex and diverse world that she spent a lot of time creating in the minds of her fans. At times it was tedious, but in the end it was well worth it. The world of Shadow hunters is crazy and scary, but it makes all the things for an exciting adventure. TMI was essentially supposed to end after three books but Clare really enjoyed writing about these characters so she added three more books. You can clearly see the divide between the two series as they really do feel like two separate series. While some might think it’s bad, it’s actually a good thing. You pretty much got two series for the price of one. We got to keep reading about the characters that we fell in love and the series that started the whole Shadow Hunter thing. TID took us back in time in the world of Shadow Hunters. While it was not really the beginning, it offered a look at how long Shadow Hunting has been around. We get a whole new list of characters (even though they have similarities to those from TMI). We got to meet and hope for a whole new list of characters as they face off against a new villain. This story was a bit more prim and proper (as it took place in England) but certainly showed a darker side to Clare and this world she’s created. WINNER: TMI. With the detailed storyline and exceptional amount of detail that went into this series it has to be the winner. This is the series that started it all and you can not beat the original. This is the core of all her other series and they all come back to this. There is no way that this series could not win this category as without it, the other series would not exist. With every major series there is a climax of the series, which is basically the point that the author has been working towards since starting the series. Both series had a big battle that of course lead to casualties but which book did it better? TMI had a lot of loose ends that it needed to tie up which could is why it had such high expectations. There were a lot of little battles throughout the story that certainly kept you reading from chapter to chapter. A lot of relationships were put to the test as war has a way of making you realize that the end could be coming soon. The characters had to face their fears and try and conquer them before it’s too late. The ending was bittersweet as Simon ultimately gets what he wants (becoming mortal and a shadow hunter) but at the cost of his memory. This was a great twist to the story as we didn’t expect something like this to happen. The ending makes you see that there could be a chance he remembers but we all know that it’s more or less just wishful thinking. TID ended with a big battle as Tessa really sees her brother for who he is. There are a lot of lives lost in the battle but in the end she is able to win by trapping the spirit in her clockwork angel. This of course comes after the fact that we finally get the answer that Tessa is a warlock and that’s why she was essentially the chosen one. The ending perhaps is the best as we see Tessa not only get her happy ever after with Will, but with Jem as well. WINNER: TID. With the fact that TMI had extended the series I had expected a big battle, but was sadly disappointed. The fight was hardly a fight and it felt very anticlimactic. TID had a big battle and of course the big surprise that Jem is Brother Zachariah certainly helped it. With each ending, the story either needs a big action sequence or a twist to make it all worth it and TID did just that. Both stories had very similar characters. So that would make comparing these two stories easy considering they both had the same starting point and same ending point. The only difference is that TMI had six books to develop the characters where TID only had three. TMI had essentially two focal characters in Jace and Clary. Yes there was a laundry list full of characters in this story that you could argue make up the cast, but it’s obvious that Jace and Clary were Clare’s main focus when she wrote the series. Jace was a broken mess of a person who never let anyone in until he met Clary. Clary was someone who was sheltered for so long she didn’t know just how strong of a person that she is. Watching as these two meet and fall in love and use that love to become the people that they are destined to be, it was nothing short of spectacular. TID has three main characters in Jem, Tessa, and Will. Tessa was a very frustrating character as she kept flipping back and forth between Jem and Will. Of course you have those who are Team Will and those who are Team Jem but really, she couldn’t lose either way. Tessa changed Will in a way that he needed. He needed to grow up and start thinking about other people rather then just himself all the time. Jem finally saw peace in his life, even though he knew it was going to be short lived. While his love for Tessa made him hate his fate in the end, it was her love that gave him the peace of mind that love is worth having even if for a short amount of time. Straight out of a romance novel, Tessa didn’t think she was ever good enough to get a boy to fall in love with her and she suddenly finds two of them in love with her. At times she frustrates us as she is stubborn and indecisive but as we read on we see that it’s never easy to choose when you love two different people. WINNER: TID. There was a better gradual change in the three characters and it was heartbreaking as you get to see it happening. Clary and Jace had more of an abrupt change that made it a little harder to swallow in the end. Of course you can’t have an epic tale without some kind of romance. Romance or a love story gives something for the fans to root for. Something to hold on to. To hope for. Both books had a war so to speak that the main character had to fight through and each one had a love interest that they had to help the through it. Each of the series had a love triangle of sorts (more apparent in TID then in TMI) and its something that is overly done in stories, especially ones like this. Though while they were there, the romance didn’t take away from the story or the main part of what Clare was trying to write. They were there to try and help the story and show that there is a small bright side to the darkness that is occurring. In TMI, we got an epic romance between Jace and Clary that spanned over six books. They met and of course fell in love instantly. Clary was not the type of person that Jace ever thought he would fall for but when you see the two of them together you can see why. She challenges him and makes him see that he’s not the evil person that he thinks that he is. Jace encourages Clary to be brave and shows her that she can do anything that she sets her mind to. TMI also had more romance in the stories because of the large number of characters it had in comparison to TID. Not only did we have Jace and Clary to root for but Simon and Isabelle together and Magnus and . Each relationship had a chance to lose the other and you did not want that to happen. You wanted everyone to get their happy ever after because that’s how things should be after a war. In TID, Tessa fell in love with both Will and Jem. Will was exciting and dangerous and brought out a reckless side in Tessa. Jem was safe and was the type of person that she could always count on no matter what. Each of them brought made Tessa feel things that she’s never felt before but of course it comes down to who she loved most. This really became a team Will/team Jem thing rather quickly. Both guys had their strong points that made you root for them and it was hard to try and choose just one. Clare had the same problem as she was able to work it so that Tessa got to be with both Will and Jem in the end. Winner: TMI. Jace and Clary had so much passion and hardships that they had to go through that they were the ones that you were rooting for from day one. There was too much back and forth in TID with Tessa and Will and Jem. It got to confusing that it was a little boring at times. In TMI, you didn’t know what was going to happen from chapter to chapter and that’s what made it more interesting. Also, with the fact that you had three relationship to hope for made it more agonizing because you believed that it was impossible for all three to come out on top and it’s very relieving to know that they did. With all the main categories done, it looks like the winner is….drum roll please…. The Mortal Instruments had all the makings to be a great series but the fact that it didn’t reach the expectations that I had for the series made it fall short in this battle. TID had a great story and a complex set of characters. The fact that it did have a smaller cast made it easier to read as it didn’t get confusing at who was who. Knowing that TMI is the jumping off point for other series can explain why there are so many characters but it got confusing at who was who and what happened in each character’s life. What series do you like better? This entry was posted in Books and tagged Cassandra Clare, The Infernal Devices, The Mortal Instruments. I personally like the Infernal Devices better. I just like the romance and characters better overall, and I think the world is just more interesting in the time period and with steampunk vibe. I’m not sure how qualified I am in judging these series, as I’ve only read 1.5 books of the Mortal Instruments series. I had to put the second book down. I’m gonna reread both series soon and see how they measure up. Excited for the new series, although I wish Clare would write about a new world. I kind of like that she’s not. she found something that works for her and she’s using it to her full advantages. i’ve seen some authors branch out and try different genres and then fail. i have yet to be completely disappointed in a shadow hunter series so until then, i’m ok with her still writing about it. I think it’s good that she is sticking with it, but I want to see her attempt to expand. I think her writing style and tendencies are great for different kinds of worldbuilding. I am excited to read the Iron Trials for this reason, but I want her to do one by herself. I just think that, although there is nothing wrong with the two series, it gets old after a while. I think it’s good that she wants to expand her signature world, but I feel like it gets old after a certain point. I would rather her quit early than disappoint us. I feel like she is a very good world builder, and her talents should be further utilized on an entirely new series. Because of this I’m excited for the Iron Trials, but I really want to see Cassandra Clare further exercise her creativity.